It hits like a ton of bricks. No matter how many times The Legal Genealogist has been there. When you see that places that was home to one who came before you, it hits you. It grabs you by the heart and it doesn’t let you go. This time, it was crossing into Culpeper County, Virginia, driving down for the Virginia Genealogical Society’s 2019 spring conference. This, I thought. This was our land. My fifth great grandparents, Thomas and Dorothy (Davenport) Baker, lived on land here — in this place — when this county was formed in 1749. The county was brand-new when my fourth great grandfather David Baker was born there in June of 1749. It was here, for the first roughly 30 years of his life, that David called home. This golden sunshine of the late afternoon sun. 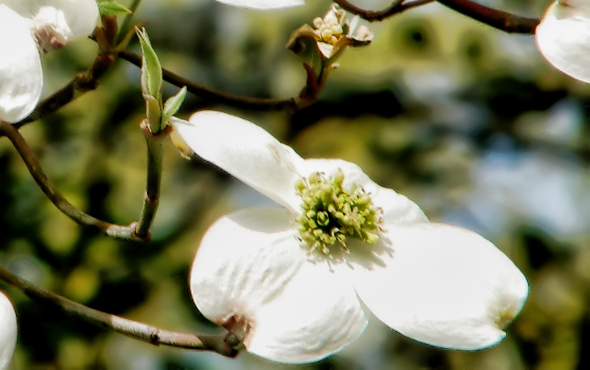 Maybe even this dogwood… or its ancestor. Yes, it’s been 270 years since David was born in this place. It may be that those fields were forests then, or those forested areas were planted fields. But we have come full circle, David and I. Where he played. And where he worked. And where he grew. And from whence he and his brothers went off to war. This is the place he called home. It’s a place called home. Cite/link to this post: Judy G. Russell, “A place called home,” The Legal Genealogist (https://www.legalgenealogist.com/blog : posted 13 Apr 2019). Keep driving down route 15 to Buckingham co. home of my paternal grandmother (Lowe-Blankenship) side. Visited once as a child to see my g-aunt, to hopefully see her father’s CW uniform only to be told “won’t show them Yankees anything” lol!!! Yes, your story hit my heart too. It was way way back 30-40 years ago for me searching an ancestral home. The date was 1749 too, and Peter Downey’s first deed to 40 acres on Buffalo Creek and at the time in Halifax County, Virginia. But, for me living in Washington State and unable to visit Virginia, my searches and enthusiasm for deed plotting metes and bounds, court house records, etc., led me through many years of trying to locate and plat Peter’s 40 acres. I did find it and located it as it is today on Google Earth. Today, this will be enough for me. But, the yearning for a scoop of dirt, a tiny blue bell plant, or whatever may have grown on his land will always be in my heart. Thank you for your post, Judy, you made my day! I felt the same way when, traveling from Colorado to Tennessee, I finally found the land my great great grandfather farmed in the 1820’s as a young guy about 22years old. It took a lot of work and two trips to Tennessee to find the spot, with maps, land grant and courthouse records, and more, plus a visit to the county sheriff’s office. What a buzz. Yessss! It’s an amazing experience. Yes! When I went to Ireland and stood in the spots where my ancestors had walked and breathed and grew, I looked at the mountains and hills that they gazed upon. My soul knew it had found home. I find the greatest peace settles upon me while I am there. Restless and longing no more.